Anatoxin is a potent alkaloid toxin derived from a species of cyanobacteria called Anabaena flos-aquae. The first published report of the potentially lethal effects of microorganisms known as blue-green algae appeared in Nature in 1878. George Francis described an algal bloom that had formed in the estuary of the Murray River, in Australia, as "a thick scum like green oil paint, some two to six inches thick." The water at this point of the river was rendered toxic to wildlife, with animals drinking it becoming rapidly ill and dying terrible deaths. The effect of microalgal toxins, both in marine and freshwater environments, has increased in severity in recent years, and poisoning episodes are becoming more common and more widespread. For example, in the midwestern United States, the consumption of contaminated water has resulted in the deaths of ducks and geese by the thousands. 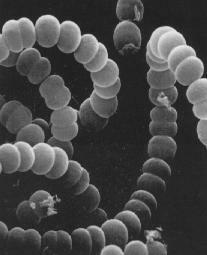 Concern for wildlife and also issues related to public health led to much investigation into the causes of these mass animal mortalities, and in the 1950s and 1960s Paul Gorham and his co-workers at the National Research Council in Ottawa established cultures for Anabaena flos-aquae, which allowed them to isolate the poisonous compounds which it produces. Anatoxin is perhaps one of the most toxic of the cyanobacterial toxins in this group, since the effects of ingestion can be lethal within 4 minutes, depending on the quantity consumed. This led to the compound being dubbed "Very Fast Death Factor." The chemical structure is shown (right) and is an interesting bicyclic alkaloid, and it was hoped that knowledge of this structure would enable scientists to discover the mode of action of the toxin. Anatoxin is a severe neurotoxin, and as such affects the functioning of the nervous system, often causing death due to paralysis of the respiratory muscles. It is known that it acts as a mimic of the neurotransmitter, acetylcholine and irreversibly binds the nicotinic acetylcholine receptor (NAChR). Normal neuromuscular action involves the release of acetylcholine, which binds its receptor, leading to the opening of a related sodium channel. The resulting movement of sodium ions produces the action potential causing the muscles to contract. At this point, an enzyme called acetylcholinesterase then cleaves the neurotransmitter, allowing the sodium channel to return eventually to its resting state, and hence the muscle can relax. Anatoxin also binds the NAChR to produce an action potential, but cannot be cleaved by the enzyme. The sodium channel is essentially locked open, and the muscles become over-stimulated and become fatigued and then paralysed. When respiratory muscles become affected, convulsions occur due to a lack of oxygen supply to the brain. Suffocation is the final result a few minutes after ingestion of the toxin. Despite its poisonous nature, however, anatoxin and many related man-made analogues have found widespread use in medicine and for pharmacological applications. Since it binds the nicotinic acetylcholine receptor irreversibly, it is an excellent means of studying this receptor, and also the mechanisms of neuromuscular action. Modified analogues are being used in order to further elucidate the receptor sub-types, and this research may lead to the development of new drugs which have none of the toxicity associated with anatoxin itself, but which act merely as acetylcholine replacement candidates. For example, the neurodegenerative disorder, Alzheimer's disease is associated with an inability of neurons to produce acetylcholine. Using the neurotransmitter itself as a therapy would not work since it is not long-lived enough. A more stable (and non-toxic!) agonist similar to anatoxin may work very well indeed. There have been many total syntheses of anatoxin in both racemic and in optically pure form. The syntheses can be grouped into six general categories. Edwards and his co-workers utilised a photochemical ring-expansion method to access the anatoxin skeleton. The full report of this work can be found in the primary literature (Can. J. Chem. 1977, 55, 1372). A very commonly employed method for creating the anatoxin skeleton is by a transannular cyclisation of a suitably substituted cyclooctene. This approach was taken by the Wiseman group (J. Org. Chem. 1986, 51, 2485). A similar protocol was developed by Danheiser and co-workers (J. Am. Chem. Soc. 1985, 107, 8066). The cyclooctene was synthesised by ring-expansion of a cyclopropyl cycloheptanamine. Rapoport's synthesis of anatoxin relied on the formation of a reactive iminium ion, which was generated by a Lewis acid-induced decarboxylation. Intramolecular trapping produced the anatoxin skeleton (J. Am. Chem. Soc. 1976, 98, 7448). In fact, Rapoport has synthesised a whole range of related analogues using this type of chemistry in order to probe the requirements of the nicotinic acetylcholine receptor. The Speckamp group (Tetrahedron Lett. 1986, 27, 4799) and the Somfai group (Tetrahedron Lett. 1992, 33, 3791) have both used similar strategies for their research on the total synthesis of anatoxin. A very elegant approach to anatoxin developed by Tufariello used a nitrone cycloaddition to produce the core structure. Reduction of the N-O bond and subsequent elaboration allowed the total synthesis to be completed. This is the only example of a nitrone cycloaddition approach to anatoxin in the literature to date (J. Am. Chem. Soc. 1984, 106, 7979). A new synthetic strategy for the synthesis of an early intermediate in the Gallagher route to anatoxin employed the cyclisation of allenes using silver tetrafluoroborate (J. Chem. Soc,. Perkin Trans. 1 1991, 145). This early intermediate was then further elaborated, culminating the total synthesis of anatoxin. A very impressive synthesis of anatoxin was provided by the Parsons group (J. Chem. Soc., Chem. Commun. 1995, 1461) who utilised a tandem sequence of reactions in one pot, to add a nucleophile to a beta-lactam. Ring-opening of this beta lactam gave a new nitrogen nucleophile, which was able to undergo a transannular cyclisation via epoxide opening. The total synthesis was completed using methodology developed in the Rapoport group.